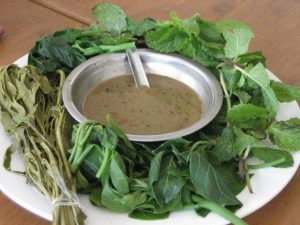 Have you ever tried Burmese fish sauce ; ngapi yay (ငါးပိရည္)? 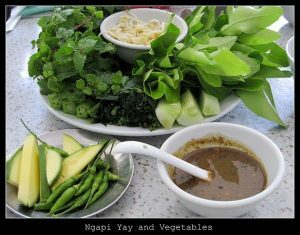 You are in Home » Food & Drink » Have you ever tried Burmese fish sauce ; ngapi yay (ငါးပိရည္)? Almost every Myanmar people takes two rice meals a day, which does not count the breakfast of course, because we usually eat our breakfast with some peas and oil only. So, when we have our lunch or dinner, we have many specific delicious items and curries, like in other countries. But among them, I would like to introduce a very famous Burmese dish, ngapi yay (ငါးပိရည္) or fish sauce. Ngapi yay is made up of ngapi – a general term for pungent pastes made from varieties of fishes. Fishes chosen to make sauce are salted and then packed in a jar or large pot and stored for a standard period of time. Then they are boiled with a cup of water and finally you get a brown paste fish sauce with a strong aroma. The resulting smell of the sauce may be weird to a foreigner, but it can augment the desire to eat for a Myanmar. 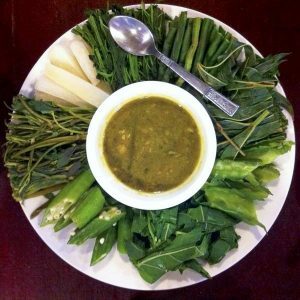 There is no other thing in Burmese tradition as delicious and as nutritious as Ngapi Yay. To classify the types of ngapi is quite a difficult process. It can be distinguished from the type of fish used to make it. For example, some make Ngapi from a whole big fish (such as ngapi kaung), but some from small fishes (mhyin ngapi) and some even from prawns (pa swun ngapi). Moreover, there are some regions that use their specific method to produce ngapi. Ayeyarwady and Tanintharyi divisions, produce it from freshwater fish. This type of ngapi is more common in Myanmar because most of the Burmese people are more familiar with the salty ngapi from these two divisions than the Rakhine version, which is very spicy. And the most famous ngapi known as Myeik Ngapi comes from Myeik, a town situated in Tanintharyi region, also known for its famous Myeik archipelago. Most Burmese add special items like onions, garlic, pepper and other spices while Ngapi is boiling. And by the time the fish sauce is cooked, we put it together with to.-sa-yar; vegetables pieces to be dipped in the sauce; on the dining table, it is ready to eat. Mostly the vegetables dips used are cabbage, tomatoes, green mangoes, green apples, olives, onions and garlic. Burmese families usually store ngapi yay in a cupboard or in the refrigerator if they have one. It can be kept for a couple of weeks at least. Therefore, when you have a chance to go and visit your Myanmar friend’s home, just ask nagpi yay. They’ll warmly welcome and treat you. Don’t forget to try! From the point of nutritional contents, as ngapi is made from fish or shrimp, it is definitely a source of different types of protein. In addition, ngapi yay can also provide iodine (which is rich in seafood especially). But there’s a problem too. Due to its high salt content, patients with diseases like hypertension and some kinds of renal diseases should not consume ngapi yay. Every country has special kind of foods and curries, which make their cuisine very delicious. Though certain foods have high status delicacy for some, for others it may be considered as weird or even repulsive. So, to decide whether ngapi yay is good or not in your palate, the only way is to taste it.